Whether you're a tournament organizer at heart, or have participated in tournaments and now wish to move forward and organize your own, Toornament is the platform to go, with a huge range of settings and possibilities for you to create your dream competition. In this article, we're going to see how to create and run your very first tournament, nice and steady. Once you're registered and logged in on Toornament, head over your Organizer Dashboard and let's play! In your Organizer Dashboard, you're gonna see a button to CREATE a new tournament. Simply click it, and fill in the required information. If you have other administrators to manage the tournament with you, we have a whole Permissions System to let you organize things and have everyone able to do his job! The next step is for you to choose what kind of tournament you want to play. How many participants are you going to pit against each other? Will they all play a League or Swiss System? Or maybe you want to split them into several Groups, and then seed the best ones in a Bracket? The choice is yours, and if you need a hand making your pick, we got some advice for you: how many phases to play and which format to choose. It's now time to open your registrations! Don't hesitate using Custom Fields for your participants to fill, if you need more information about them when they register. 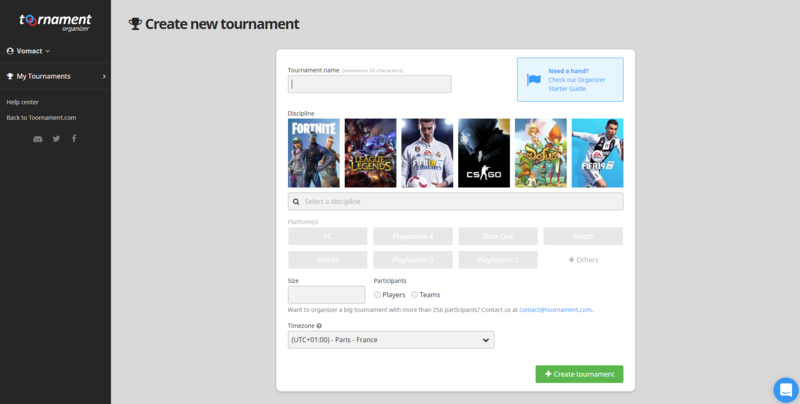 Alternatively, you can also manually create participants directly in your tournament, but you will have to fill in their Toornament Account Emails in the info to make sure they can enjoy everything the platform has to offer. When your participants are created, or accepted through registrations, your next mission is to place them in the structure you've created. The detailed process is explained here, but to make it quick, you get to choose which stages each participant will play in, who they're gonna face, when and in what order. You have a nice tournament, up and running, now is the time to share it with the world! By the way, if you opted for the Registration process for your participants, this part comes way earlier, because you will have to share the tournament for participant to register in it. A few rules of thumb here are to make your front page look good, to try and attract the spotlight and to promote your tournament.